If you enjoy Restaurant Month deals in your home town, then you’ll be pleased to know that HMSHost is once again bringing the concept to airports. Through May, HMSHost is hosting Airport Restaurant Month in about 90 participating restaurants at more than 50 airports across North America and Europe, including those operated by HMSHost’s parent company, Autogrill, at Brussels Airport, Zürich Airport, and Leonardo da Vinci–Fiumicino Airport in Rome. During restaurant month in my town, each restaurant creates their own special menu to highlight their offerings. For HMSHost’s Airport Month, each restaurant is customizing a core menu of dishes created by HMSHost’s corporate executive chef and culinary team. Guests will receive a choice of entrée, accompanied by several side dishes. 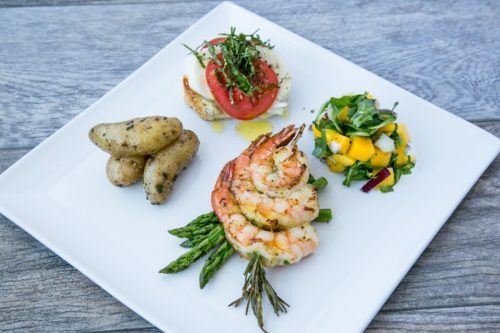 Some of the dishes travelers will find include Rosemary grilled shrimp; flat iron steak; Parmesan-crusted chicken; and a baked Portobello mushroom. You can see the full list of participating restaurants at AirportRestaurantMonth.com.